The crowd cheered, they hate Secretariat just as much as Trump. 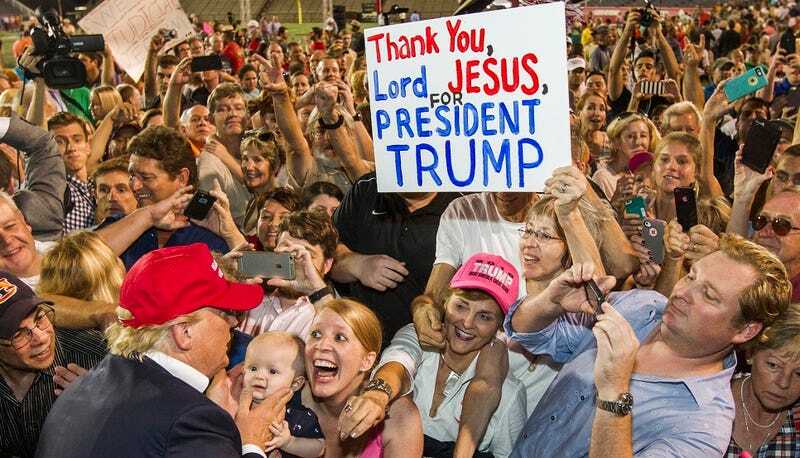 And though the crowd was not as large as the Trump campaign expected—they said 40,000 RSVP’d for the event—those that came were thrilled to have Trump lay hands on them. Everyone except for one single baby. As Trump cupped the baby’s chubby cheeks with his hands, the baby betrayed his bafflement at the adults around him. There, on the baby’s face, was a mixture of confusion with slight fear. That baby is all of us.